Quality Angus Beef, under one management means all cattle are raised and fed on the same farm. All grass and grain are grown on the same farm. Peace of Mind knowing all cattle qualify for the Angus Source Program with the American Angus Association, tracking the Angus heritage to ensure safety of our product. Knowing that No Implants are used at any time and No Growth Hormones or Antibiotics are fed at any time. Peace of mind knowing that you can reserve the same offspring from the same line the following year. A tag number is provided with your initial purchase. To reserve the same offspring the next year, just provide your tag number with your next order. An email will go out to recurring customers 30 days before we sell to new customers. Dry Aged for 21 - 30 Days to improve flavor and tenderness, with NO growth hormones or antibiotics. 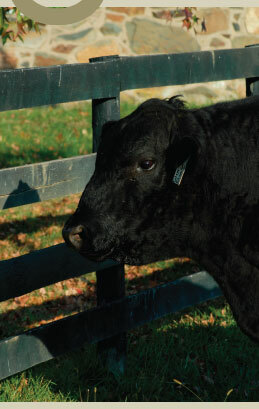 Martin’s Angus Beef grades to a USDA High Choice to Prime Grade, as found in top restaurants. Flavorful, Tender Beef, like you have never had before!